Falcon Press Books produces a series of manuals for various outdoor activities called Falcon Guides. For over 30 years, these guides have been setting a new standard for recreational outdoor content. Top experts and enthusiasts contribute to each title to ensure that only the most accurate and trustworthy information and tips are distributed. The folks at Falcon Press Books extend an open invitation for readers to equip themselves with knowledge and then go forth to experience the endless adventures that only Mother Nature can provide. It all began in 1979 with one book. Bill Schneider of Helena, Montana got things started by writing Hiking Montana. Now, Falcon is one of the leading publishers of over 700 outdoor rec books, which makes them an absolute authority across the entire country. This growing library of knowledge covers everything from rock climbing and hiking to wildlife identification and environmental preservation. No matter what content their books contain, it is always their goal to supply your brain with the highest caliber information on the places you should go, how you should get there, and what to do upon arrival. Selections such as Falcon Guides How to Rock Climb: Toproping contains all the information beginner climbers need to get started. Belay techniques, anchor set-ups and other toproping essentials have congregated in this book to help newcomers tackle the sport the right way. If you consider yourself more of an experienced veteran on the walls and crags, perhaps something like the Falcon Advanced Rock Climbing would be the choice for you. As your guide to scaling the treacherous volcanoes of the Pacific Northwest, books like these reveal an expert approach to some serious adventure. 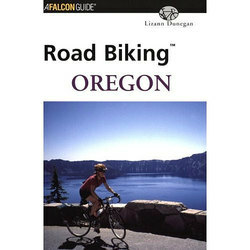 Falcon knows their pedaling better than most, so they crank out info-packed editions like the Falcon Guides Road Biking Oregon. Forty of the best rides in the state are documented here with everything from some simple rides to multi-day challenges for the more intense cyclists. All kinds of details, sights, attractions, events and maps adorn books just like this one. Much of Falcon’s success can be attributed to their unwavering focus. By engaging the spirits of outdoor lovers, they are able to nourish the heart and soul of an adventurous America. Countless voyages into the wilderness have familiarized the Falcon contributors with the unparalleled beauty and rich history of this country, and they want nothing more than to share their experiences with you. Falcon Guides are perfectly at home just hanging out on a coffee table, or jammed inside your pack with pages folded over as bookmarks of your favorite spots. So, outfit your mind for success in the outdoors, and get out there to uncover some adventure with Falcon Guides.